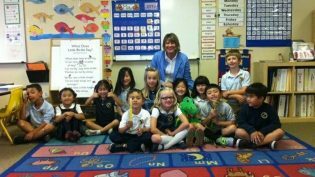 Our hygienist, Kelly, recently visited the kindergarten classes at the Cambridge school in Rancho Penasquitos. It was a great time of sharing with the students the basics of dental care and how important it is to take care of your teeth. Kelly shared how damaging “cavity bugs” can be to one’s teeth and gums and how brushing and flossing can get rid of these bugs so that cavities do not form. Each student got a chance to brush Allie the alligator’s teeth and there was definitely a lot of fun and laughter that accompanied it. At Classic Dental Smiles, we see patients of all ages. Our trip to the Cambridge school was in hopes of educating this generation’s young students about the importance of maintaining healthy teeth and gums. The mouth is the gateway to the rest of the body and keeping a healthy mouth will in turn help us to keep a healthy body. Remember to brush and floss every day! If you would like our office to visit your school or organization, please contact us via phone, email, or by filling out the information box to the right.